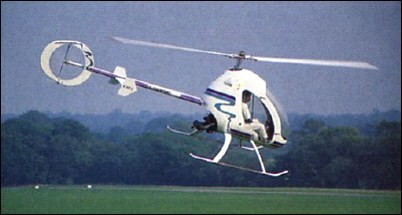 American Sportscopter (ASI) was formed in 1990 to produce an ultralight helicopter to FAR Part 103, which was designated Ultrasport 254. This kit-built machine first flew in July 1993. It is a single-seater with a semi-enclosed composite fuselage structure, skid undercarriage and a tubular tailboom with tailplane and twin fins and a tail rotor enclosed in a large circular shroud. It is powered by a 55hp Hirth 2703 engine mounted behind the cockpit rear bulk-head. The Ultrasport 331 is a larger version of the 254 falling within the American "Experimental" category (FAR Part 21.191g), with increased range and higher gross weight. This first flew in December 1993. It was followed by the Ultrasport 496 two-seater which commenced flight testing in July 1995. It has a wider cabin than the 331 and uses a 95hp Hirth F.30 engine. The Ultrasport helicopter kits are manufactured in Taiwan. R.Simpson "Airlife's Helicopter and Rotorcraft", 1998 American Sportscopter International Inc. was founded in 1990. North and South American markets are covered by US office; rest of world by Taiwanese office. An unmanned surveillance prototype named Vigilante 496 (first flight February 1998) was developed by SAIC. In late 2001, ASH was looking at providing armament, including 70mm rockets and Hellfire missiles. TYPE: Single-seat ultralight helicopter kitbuilt. PROGRAMME: Prototype (254 version) first flight 24 July 1993 and publicly displayed at Oshkosh that year. Two prototypes built and tested. Prototype 331 (N331UV) first flew December 1993. 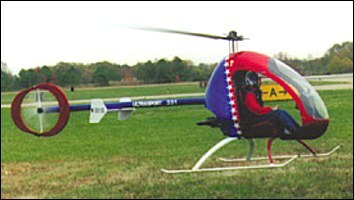 LBA certification was expected by early 2002: version is only marketed in countries where ultralight helicopters are regulated to company's satisfaction. 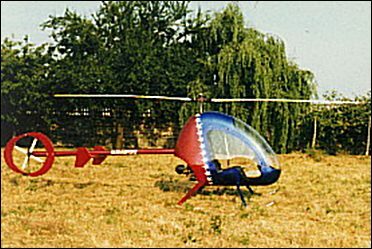 In late 2002, it was announced that Huzbou Taixing Aviation Technology of Huzhou, China was producing helicopters from kits, including examples of Ultrasports. CURRENT VERSIONS: Designations reflect empty weight in pounds. Ultrasport 254: Single-seat ultralight to FAR Pt 103. Ultrasport 331: Experimental category FAR Pt 21.191(g); single-seat 'growth' model. Meets FAA 51% amateur-built kit rules. Ultrasport 331H with 48.5kW Hirlh H32 added to range in 2003 and will eventually replace the Ultrasport 331. CUSTOMERS: Total of 70 single-seaters sold by end 2002, of which more than 50 were flying. DESIGN FEATURES: Design objective of 254 was basic weight not to exceed 115kg (254 lb) in order to comply with FAR Pt 103. Two-blade composites construction main rotor with tip weights for momentum conservation m event of engine failure, 8� linear twist and infinite life; shielded two-blade tail rotor; tailplane with tins at tip; tail rotor drive carried in narrow streamlined tailboom. Centrifugal sprag clutch for starting engages rotors at 2,000 engine rpm and automatically disengages in the event of engine failure. Quoted build time 80 hours. Broad (2.44m) skid track helps to prevent rollovers. FLYING CONTROLS: Conventional collective, cyclic and yaw pedals. Floor-mounted cyclic option available since 1998; early models had top-mounted stick. STRUCTURE: Generally of epoxy resin, graphite fabric and Nomex honeycomb; aluminium tailboom. LANDING GEAR: Aluminium skids stressed for landings at up to 2.5g; floats (weight 18kg) optional. POWER PLANT: One 48.5kW Hirth 2706 dual-carburettor two-stroke engine with electric starter (also option for 254) or Hirth H32 of same power in 331H; 12:1 planetary transmission. Fuel capacity 38 litres. SYSTEMS: Electrical: 12V battery; 14V alternator fit appropriate to engine. 1) Are you still selling the Ultrasport Helicopter? 2) Do you have any for sale right now? 3) Any FAA changes we should know? 3) How much is the cost of the unit fully assembled? 4) will the ARROW provided with each ship? 6) Do you have a training program? if so, do you have an hourly rate for the Pilot. 7) what is your inventory? It is our intention to purchase Twelve (12) Ultrasport 496 (fully functional) over a period of 22months. The schedule of delivery is to be determined, however we know the first two are needed by the end of the year. Our investors will be in town to do a walk thru of your facilities and the option of placing an order after the walk through. For additional information Please contact me at 757-309-7058 email me. 502-59579140 to make an offer, right now is in the paint shop. Merci de m'indiquer les bonnes adresses ! what is the price of the 331 and where do I get one? ��������� ��� ������� � �������. ��������� �1� ��� � ��� ���� ������ ? I am a Namibian and have the oportunity to buy a Ultrasport 496 from someone in Namibia. The heli is without a engine, rotorblades and instruments. Wat wil it cost me for the engine, rotorblades and instruments? Waht is the cost of a new complete Ultrasport 496? i would like to buy one of your ultralight helicopters.can you ship one to india? what are the prices and the shipping costs?please send details via returning mail.anis,delhi. Could I please receive more info on the 331H and the the 496. More tech details would be appreciated. Also how much if delivered to Spain? To whom it concern I am requesting information and price list on the ULTRASPORT Model #254 and the 331. I am interested in retailing your product in the UK. Can you please let me know i it is already being sold in the UK, if not then can I please let me know if you would be interested to export to the UK. how do the rotors work? WHERE CAN I PURCHASE 496 HELICOPTER? ARE THEY KITS OR CAN YOU BUY THEM COMPLETE AND WHAT IS THE COST?